Montaña de Fuego Eco Resort is located in La Fortuna, San Carlos, one of the most beautiful regions of Costa Rica. The hotel takes advantage of the natural beauty of the area and emerges as a peaceful oasis with magnificent vegetation and diverse fauna. Rooms are spacious and comfortable. Enjoy spectacular views of the Arenal Volcano, whose incredible and fascinating eruptions will astound you. 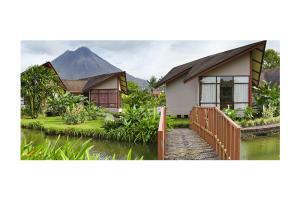 Located in La Fortuna, close to the Arenal Volcano. Aquarela's Restaurant - Costa Rican specialties. Safari adventure float, White Water Rafting, Canopy tours, Butterfly farm, Sport fishing, Frog Farm, Suspended bridge, Sky Tram and trek.